As the title suggests, I struggle with sleep in that I get far too little sleep. However, this is not a new problem and one that I have struggled with starting in my teenage years and on. Unfortunately, my struggle is far from unique: studies show that 87% of high school students and 75% of higher education students get far less sleep than recommended. A 2011 sleep poll shows that high school seniors are averaging 6.9 hours of sleep a night when they should be getting between 8.5 and 9.5 hours a night. This lack of sleep amongst teens has been serious enough to be declared an epidemic by the American Academy of Pediatrics. So why is this a problem? We go through many changes in our teenage years. We physically grow at a pace faster than at any other time in our lives, other than perhaps when we were babies. We also undergo profound mental changes as well with an increase in intellectual capacity, emotional intelligence, and behavioral capability. This rewiring continues well into our 20s and is not confined to the teenage years. Sleep is a vital part of this change when much of the rewiring happens as our brains improve ourselves. A lack of sleep stunts this growth and hobbles are capabilities and ability to learn as adults. So why does this happen? Students face significant pressures in high school and higher education between academics, social, and other activities that sap their time and mean later bed times. Even students that try and sleep earlier tend to have trouble falling asleep due to electronic devices or reading in bed. These habits can start before their teen years, for example: reading books in bed. I recall reading engrossing tales late into the night before passing out and waking up far too early. These habits carried into my teenage years and then into university. In higher education, it got to the point that I was sleeping in until noon and skipping morning classes. This behavior was quite common amongst my peers and the first few years of university were made more difficult as a result. So what, can you, as a student do? First, you have to recognize the impact a lack of sleep as on you. Not just an immediate impact to your grads but the long term impact to your ability to learn and then think critically throughout your adult life. Next, identify habits that prevent you from falling asleep. It may be spending time on social media – Snapchat, Facebook, or messaging apps – late into the night. Try and reduce those habits and give your mind a break before you head to bed. If you drink caffeinated beverages in the late afternoon or evening, they can affect you well into the night and impact your ability to fall asleep. These changes are not easy and take time to implement. I still struggle with going to bed on time as I tend to work on exciting or interesting problems late into the night before realizing that I have to be up early for a meeting. However, there are weeks where I head to bed on time and in the mornings feel well rested and energized; those days tend to be my most productive. If all else fails to motivate you, then remember that your grades and future hinge on your ability to learn and perform under stress. 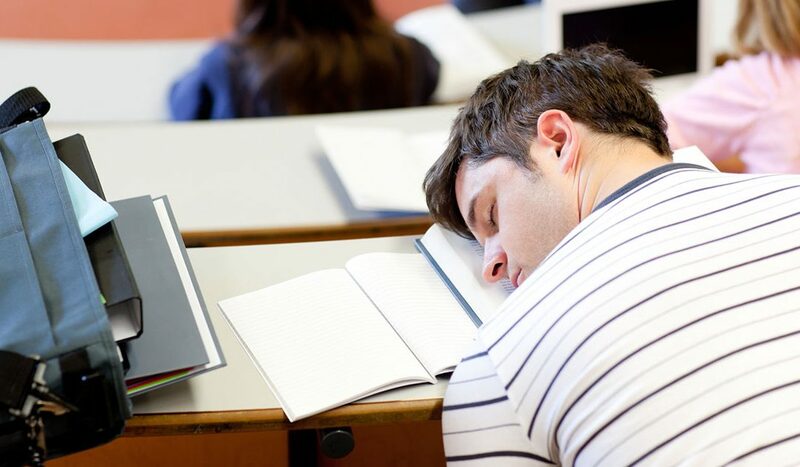 You need to be well rested and able to do so, especially on exam day. So if you are reading this late at night, share this article on social media ;), turn off of your phone or computer, head to bed, and good night.